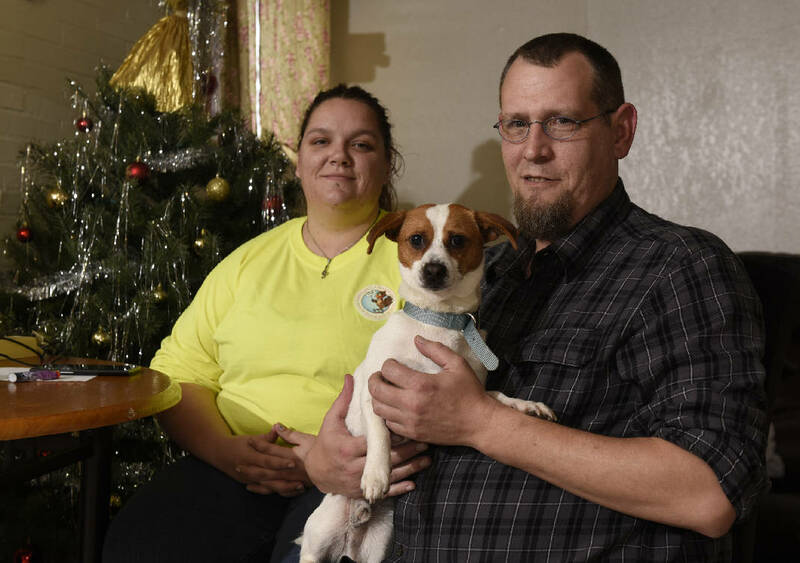 Photographed on Sunday, Dec. 13, 2015, in Chattanooga, Tenn., Ashley Harmon, left, and Joshua Adamson, holding their new dog Shorty, were homeless until the Neediest Cases fund provided them with $393.96 so that they could have a place to live. Chattanooga Times Free Press Neediest Cases donors. Illustration by Staff File Photo /Times Free Press. Ashley Harmon and her boyfriend, Josh Adamson, will celebrate their first anniversary as a couple on Christmas Day in a house instead of a tent. "I'm excited and ready to move forward," Harmon said. If all continues going well, Harmon and Adamson plan to marry within the next year. And Adamson wants to save $1,000 to get his driver's license restored, get his commercial driver's license and become a truck driver. They have high hopes for a bright future, thanks in part to Chattanooga Times Free Press readers who contribute to the Neediest Cases fund. The fund gave Harmon $393.96 toward rent for their new home. They've been in their one-bedroom apartment off Dodson Avenue for two months. Chattanooga Times founder Adolph Ochs launched the Neediest Cases fund in the New York Times in 1912 and in The Chattanooga Times in 1914. Ochs started the project after meeting a homeless man on Christmas night in 1911 while taking an after-dinner walk. The Chattanooga Times Free Press continues the tradition, highlighting the stories of people in need. Readers contributed more than $47,000 that aided 300 families during the 2014 season. Local attorney William Aiken said he and his wife, Ann, contribute annually. "We give to join with others in the community in providing help for good people, and I want to use the word 'good' because these are good people who need a boost," Aiken said. So far this year, among those the fund has assisted are an elderly woman who needed help paying her electric bill, a teenage girl who needed help getting transportation for her cancer treatments and a woman battling multiple sclerosis who needed assistance with utilities. But there are many more. Harmon is one of the latest people to get help. She deals with bipolar disorder, ADHD, anxiety and depression, which make it difficult for her to keep a job. When Adamson lost his job, the couple became homeless. They moved to Chattanooga from Florida because Adamson once lived here and knew of resources the city had to help homeless people. The couple purchased a tent and slept in a parking garage near a gas station on Frazier Avenue, underneath the walking bridge at Coolidge Park and near the downtown YMCA. They also lived a short time in a hotel before they got a Housing Choice voucher to assist them in paying rent. The rental assistance from Neediest Cases helped pay the couple's portion of the rent. Adamson, who found work cleaning cages and walking dogs at McKamey Animal Center, said he's thankful for stability. "We haven't had our own place in eight months, just going from here to there with no break," he said. "But this is my house, and it feels really good."